Mmmm....frozen sugar water.....my 14th favorite thing in the world! 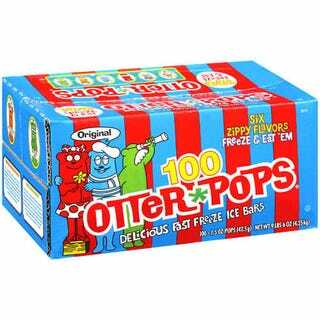 Some of you know about otter pops. They are frozen ice treats that people consumed as kids. Some will still eat them as adults. If you were like me, the green were the last ones left. Anyway, here it is, Wednesday. Shooting is over, so I'm not drinking massive amounts of beer on Tuesday nights. So I should have a post for you. Not because of beer, like in the past. But because of a family emergency. Those of you who read my post in yesterdays Roll Call know my dad had a medical emergency Monday night. Let me just say thanks for all the well wishes. They must have worked, because otter pop is back home and doing great. And that's why theres no oddity tonight. I opted to spend my time making sure dad was fine, and ended up not having time to research the subject for tonight. I do have a good oddity for you, and I planned on having it tonight, but....otter pop is more important, I think. He had a TIA. That would be a Transient Ischemic Attack. It presents its self like a stroke, but isn;t actually a stroke, per se. Seeing as how otter pop had a stroke and brain surgery back in March, it concerned us greatly. But, I can safely report that all is fine. Because of various medical issues he has, otter pops heart rate is about 50 beats per minute. That's low. And that's what cause his TIA. Doctors adjusted his medication, so his heart rate should go up to around 60-65 beats a minute, and that will take care of his issues. I do appreciate everyones well wishes. It really helps when your 71 year old otter pop is down for the count. And, because I have this update on otter pop, I don;t have an oddity for you. But, I promise, tomorrows will make up for it. And if it doesn't, well.....then I guess I failed you. And, honestly, all I can say is: "Get over it.". My family is more important than an oddity for you guys. You guys are like family as well, but otter pop is actual family, and I have to put him first. I know you all understand. And I appreciate it. And otter pop does too.